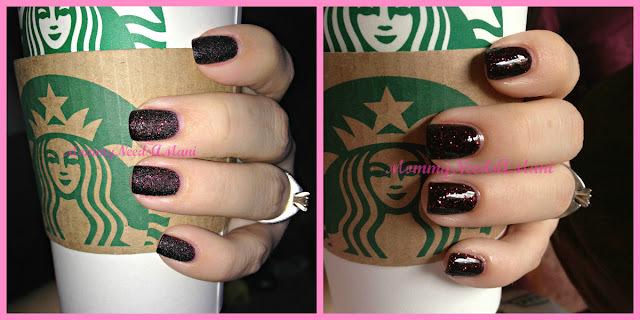 Linking up again this Friday with Tara and Vicki for the Nail Files. I have spent most of the week wearing Can't Let Go from OPI's Mariah Carey line. It's called liquid sand. I liked it when I first put it on and I loved it more and more with each passing day. Stay the Night. I don't love. So I tried it with topcoat. For me, much better. I think I'd love the black without topcoat more if the glitter was black, not hot pink. Left: no top coat. Right: SEVERAL layers of topcoat. This polish has already been removed. My nails are bare and bored. I can not seem to decide what to keep on them. I'm really eager for some inspiration! I haven't tried any of the liquid sand polish yet, not sure I'd like them, but this purple is really pretty! I agree the "stay the night" color is much better with a topcoat! Love this one such a pretty color and I love it with and without the top coat! Gurl, your nails are perfect! The bottom lines are always so freaking straight--HOW DO YOU DO IT?! ;) Your second mani looks so different with a top coat! It's crazy! I think I like it better with the top coat, too. I'm a sucker for shine. I keep meaning to try those!! Love the black. I need to pick up a true liquid sand polish because it is fer cool looking. I tried to mimic the effect earlier this week and failed miserably. love the black! very cool looking!